Boys version of a classic Puma style. Size:Labelled as a size Age 3-4 Years. Excellent used condition- I can't see any pulls on the material. The Arsenal sign at the back has been worn away- see photos. Navy blue with florescentyellow in colour with zip up pockets. Youth Age 11-12 - 152cm. These are PUMA Boy's Low Cut Socks 6 Pair Black Shoe Size 9-3.5, sock size 7-8.5. Gelb 96% Baumwolle 4% Elasthan. Boys Size XL Puma Black/Gray Jacket. Condition is Pre-owned. Shipped with USPS Priority Mail. Soft puffer sleeveless vest. Embroidered logo. Snap button front. Color : Black, red, light black/gray. Material : 100% Polyester. Two hand pockets. Boys puma tracksuit bottoms age 11-12 New. Dispatched with Royal Mail 2nd class signed for. New without tags. I paid £20 for these and they have just hung in my sons wardrobe because he favoured his black ones. Selling for £10.00 I only sell items in perfect clean condition. Well packaged. I do like to post signed for to take away and possibilities that your item is lost. If you do not wish to pay for signed for please message me. 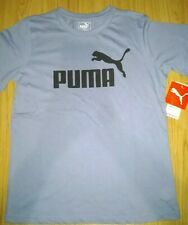 100% Authentic Puma. Size: XL (18-20). Size Type: Regular. 60% Cotton. 40% Polyester. Sleeve Length: Short Sleeve |. U:|Style:|Rep:|schart:|Minutes:3|Am Sleeve Length: Short Sleeve. Made by Puma. 100% polyester.